1. THE ARTIST MAY CONSTRUCT THE WORK. 2. THE WORK MAY BE FABRICATED. 3. THE WORK NEED NOT BE BUILT. EACH BEING EQUAL AND CONSISTENT WITH THE INTENT OF THE ARTIST OR THE DECISION AS TO CONDITION RESTS WITH THE RECEIVER UPON THE OCCASION OF RECEIVERSHIP. Initially, Weiner’s statements were short descriptions of hypothetical sculptures (‘A 2 inch wide and 1 inch deep trench cut across a standard one-car driveway’, 1968) but later the lines became more ambiguous (‘With relation to the various manners of use for/of various things’, 1974). Although Weiner’s ‘declaration of intent’ could imply a lack of interest in the presentation of his work, he takes particular care with scale, colour and spacing when presenting the work himself. Using professional signwriters or constructing three-dimensional letters for more permanent works, the aesthetic look of the finished work has become increasingly important. 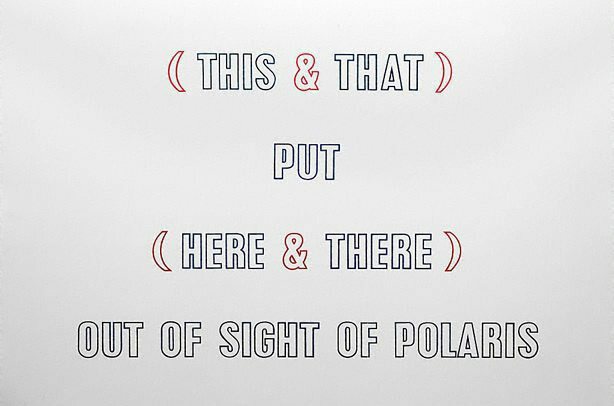 '(THIS AND THAT) PUT (HERE AND THERE) OUT OF SIGHT OF POLARIS’ was conceived specifically for the 8th Biennale of Sydney in 1990 and was installed under Weiner’s supervision. At the time he was planning this work, he was also working on a commission for an outdoor public sculpture in Holstebro, Denmark which read: ‘(SOME OF THIS) + (SOME OF THAT) GENTLY PLACED UNDER THE LIGHT OF POLARIS’. These two works are closely related in concept, one situated where the North Star (Polaris) is noticeably high in the sky and the other situated at the other end of the world, where the North Star is not visible at all. In an artist’s statement printed in the biennale’s catalogue, Weiner wrote: ‘Essentially the question is whether or not a change in venue does in fact bring about a change in value. With a material moved here & there does the displacement give not only the materials but as well the assemblage another use for art within the society it finds itself functioning with. Is the placement of the object in relation to the human being the point or is the placement of the human being in relation to the object the fact?’.2 Here at the AGNSW, placed on a feature wall as we approach the contemporary collections on level 2, the text functions as a description of the international collection. Like the biennale for which the text was commissioned, the collection is indeed an assortment of things gathered from all over the world and brought here out of sight of the North Star. 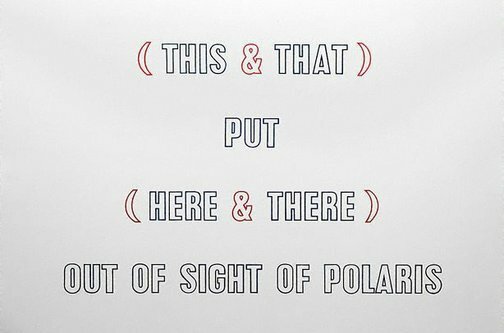 Donna De Salvo, Lawrence Weiner: as far as the eye can see , 'As far as the eye can see', pg.58-99, New York, 2007, 80, 84 (illus.). Michael Wardell, Contemporary: Art Gallery of New South Wales Contemporary Collection , 'Ideas and actions', pg.60-107, Sydney, 2006, 104, 105 (colour illus. ).